The W112 Smoke diver suit, PBI Max, builds on Wenaas’ years of experience in the development and production of clothing for smoke divers. The W112 Smoke diver suit has been the best on the market – by a good margin – for many years as regards protection against heat penetration, which is the primary function of smoke diver clothing. Only the best properties in this area will provide crews with the extra protection and performance demanded in finely balanced situations. Utskiftbare brystlommepaneler for alle typer kommunikasjonsutstyr med fortsatt mulighet for bruk av skulderstykke. Man kan bytte lommesystem og fortsatt bruke røykdykkerdressen dersom nye krav til kommunikasjonsutstyr kommer før den typiske sliteterminen på 5/10 år er passert. Lommepanelene finnes i både høyre og venstreutgave, og kan kombineres fritt. Man kan velge å ikke ha på brystlommer i krevende situasjoner. Borrelåsen vil da kunne beskyttes med et eget beskyttelsespanel. Wenaas has added an internal cuff to the sleeve of the Smoke diver jacket, PBI Max, which perfectly matches our new fire-fighter glove, Tex Grip 2.0. D-cuff. The new fire-fighter glove features a cuff designed to match the interior cuff on the smoke diver jacket. The intention is to prevent hazardous or polluted liquids running down into the glove – and to protect against the associated health risks. 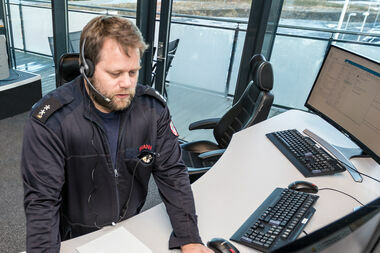 The concept of exchangeable pocket and text panels is now being transferred to other emergency response products from Wenaas – our new Uniform vest, for example, and the upgraded Rescue coveralls. With these new properties, the fire service will have the chance to develop effective routines for highlighting the chain of command and skills at an incident location. 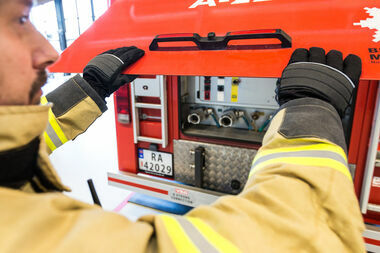 Wenaas recommends washing fire and rescue uniforms in washing machines using special programmes for contaminated fire and rescue uniforms. Such special programmes have properties that are lacking in conventional domestic machines, in particular when it comes to the amount of water used during rinsing and the rinsing time. Kindly observe the supplier’s’ directions for washing, drying and waterproofing. 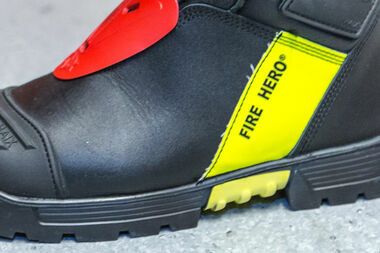 Our Fire-fighter boot, Haix Fire Hero 2, features an optimal lacing system with a fast locking mechanism. Fire-fighter glove, Tex Grip 2.0 D-cuff features a cuff that perfectly matches the interior cuff in our new Smoke diver jacket, PBI Max. We supply everything a fire-fighter needs in the way of clothing - to ensure that he/she can enjoy a safe and comfortable working day.